Driving through the rural roads of the Tenasserim (Tanintharyi) region in Southern Burma, vast plantation of palm oil and rubber trees stretch on either side of the roads. Signboards along the roads and in the town proclaim that, ‘Tanintharyi Division is the Oil Bowl of Myanmar’. 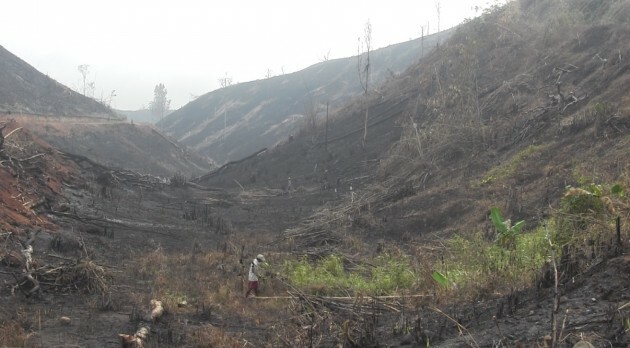 Government policy to use vast tracts of farmland and forests for rubber and palm oil is now under scrutiny and has raised many questions by villagers and environmental groups. Villagers say government policy for contract and industrial farming has a dark side – land grabbing, death threat, displacement and poverty. Noh Pa Doh village in Palauk Township, Tenasserim (Tanintharyi) Division is a Karen village that has been taken over by a large commercial rubber plantation project. The villagers were forcibly relocated by the former Burma military regime. Villagers alleged that the Burma Army division commanders forcibly relocated villagers and re-sold their confiscated land and plantations to a Burmese businessman, U Hla Than, the owner of Pyi Pho Htun International Co Ltd.
Naw Htoo Na, a Karen villager from Noh Pa Doh explained to Karen News. In the part upper of Noh Pa Doh village, 44 residents had their land illegally seized, resulting in the loss of up to 1,500 acres according to data collected by the villagers. The State Agriculture Department records show that in January 2010, 216 companies received a total of 1.75 million acres (708,200 hectares) of farmland in the form of state concessions. Villagers and human rights have documented that under the former military regime, land grabbing was a widespread, systematic practice. Government bodies, particularly military units, seize large tracts of farmland usually without paying compensation. A significant proportion of this land grabbing took place in ethnic states. Saw Albert the field director of the Karen Human Rights Group, told Karen News. Saw Albert points out that land grabbing under the military backed civilian government of President Thein Sein the practice is still wide spread. The Washington based Centre for Strategic and International Studies in a report on its website said. The land has been taken for commercial agriculture projects, either run by the military or by companies with ties to the military. Some land is also leased to foreign companies, who have ties with many of these Burmese companies. Under military rule, farmers say that they knew that it was hopeless to challenge these land seizures. Any protest would result in a lengthy prison sentence, in some cases those who challenged the government simply disappeared, or, as happened in ethnic areas, protesters had been executed. Saw Htoo Gay from Noh Pa Doh village spoke to Karen News. Naw Htoo Na said she was threatened with jail if she did not leave her land. The result of this land grabbing is greater displacement among Burma’s rural population. It has increased rural poverty and driven villagers to take risks and seek to work illegally in Thailand. Saw Albert from the Karen Human Rights Group said. Under Burma’s 2008 constitution, the state remains the ultimate owner of all land and natural resources in the country. Land rights are given in the form of either leasehold rights, user rights, or the right to cultivate a certain plot of land. Environmental groups say that the two new land laws were passed in 2012 – the Farmland Law and the Vacant, Fallow, and Virgin Land Management Law give them little or no protection. These laws were intended to clarify ownership under the constitution and provide protection to land leaseholders guaranteeing more rights of ownership. To date, the only ones continuing to profit from this new law will be big business and government interests.